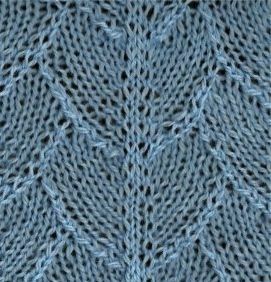 Another knitting stitch name in the post Found Poetry is "Dragon Skin." It's a stitch that I have always liked even though it's meant to look like the scales of a reptile. Here is my photo take of the stitch. 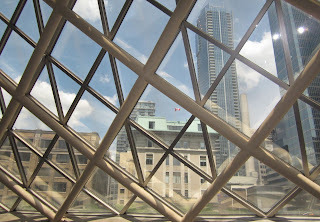 It's actually the roof of the Roy Thompson Hall in Toronto. And here's the inside of the dragon. 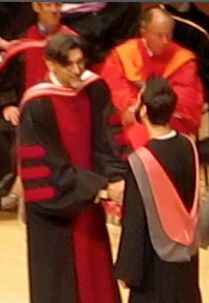 I was actually at the auditorium yesterday for my son's graduation from OCAD - Ontario College of Art and Design which is now a university so he was there to receive his Bachelor of Fine Art degree along with about 300 other students. It was really an awesome occasion. Dragons are all about good luck and success, power and achievement. It's a fitting metaphor for a graduation and it all started with a knitting stitch, a very powerful knitting stitch. I couldn't resist carrying out the dragon metaphor with this short video of an art installation in the grounds adjacent to the hall. It's a grouping of windsocks, but with a little imagination they could be flames from the dragon's mouth. and in the belly of the beast 300 grads were on fire.